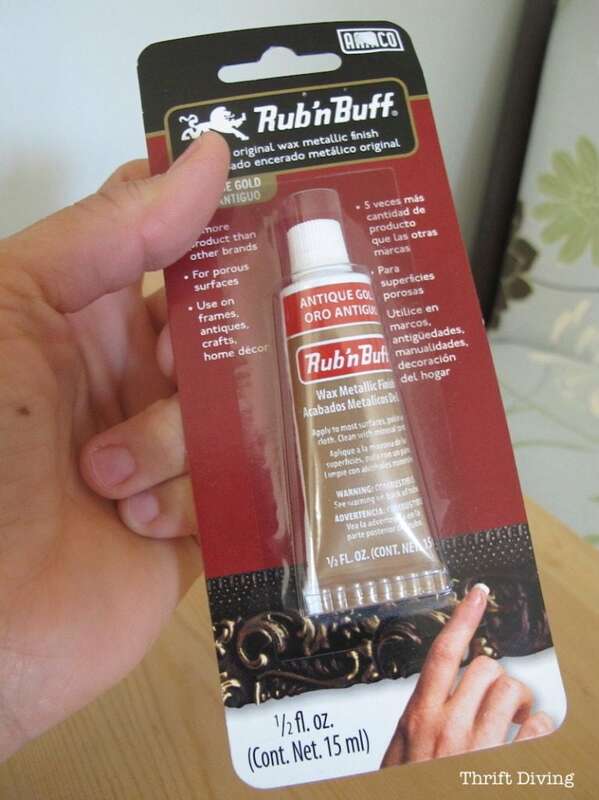 So funny the amazing craft material is called Rub ‘n Buff, because, while I do the “rub” part, I tend to forget the “buff” part. HA! They should have named it “Rub ‘n Walk Away.” Because that’s exactly what I do. And I ain’t afraid to admit it. Regardless of whether I use it properly, it’s one of my most favorite tools in my DIY toolbox. This stuff is amazing, and I’m going to show you why. And you can buy Rub ‘n Buff for only a few dollars! What is Rub ‘n Buff? To apply it, just take a small amount and rub it on with your finger (it stains, so watch out!!) or a lint-free cloth, then rub it over the things you want to “paint.” Then buff to a shine. I tend to add a few coats to get even coverage. Have you seen the price of knobs and pulls lately?? Okay, yeah… you can score some good ones on coupon days at the craft store, but if you need 6 – 8 or something, that adds up pretty quickly. I don’t like to spend a lot of craft supplies or materials, so reusing what I can is ideal. Plus, I just like to save old hardware because there’s something so pretty about using the same hardware. It’s as if it’s just made for that piece, right? Here’s the hardware I saved from a desk I gave my mom for Mother’s Day, and it looked great! The tarnished handles magically were covered up. You might be asking why I didn’t just spray paint them. 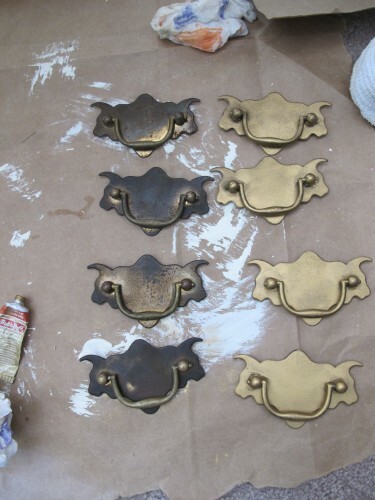 While that’s an option for old knobs and hardware, spray painting something leaves a coat of….well…..paint. It looks obviously painted. Rub ‘n Buff doesn’t look coated or thick the way spraypaint would look. It just looks new. 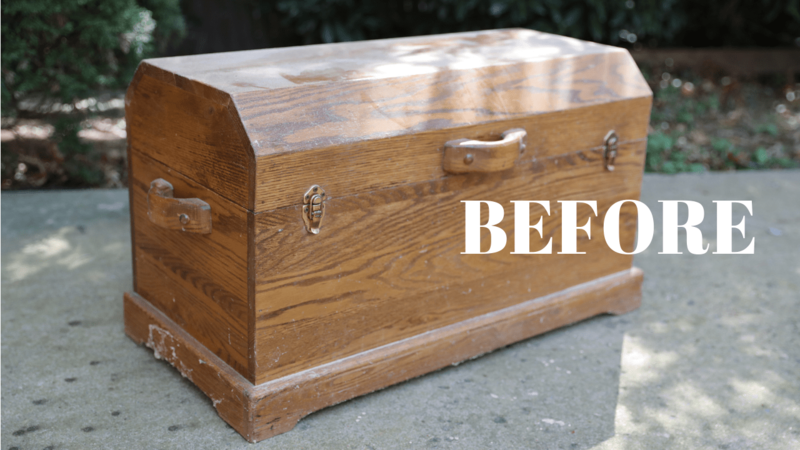 I made over this awesome oak chest from the thrift store and wanted to freshen up the clasps on the front of the chest, too. 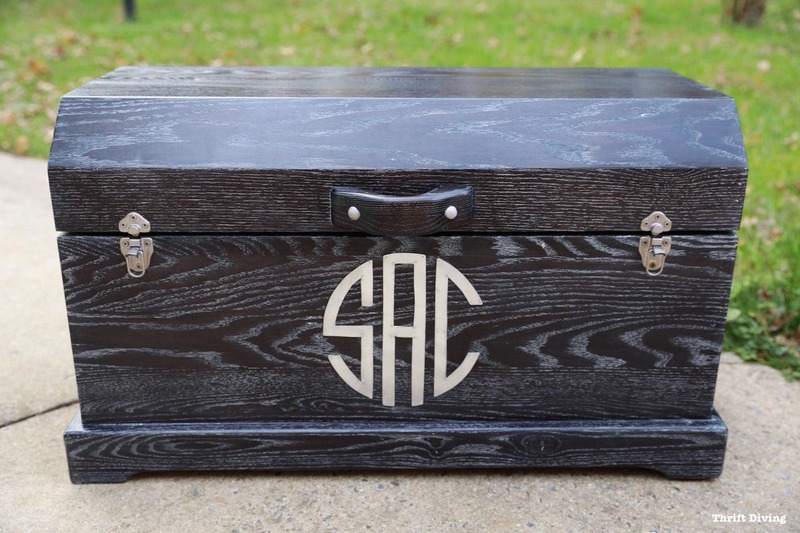 Instead of buying all new hardware, Rub ‘n Buff transformed the clasps from worn-out gold to silver to match the rest of the newly refinished oak chest! 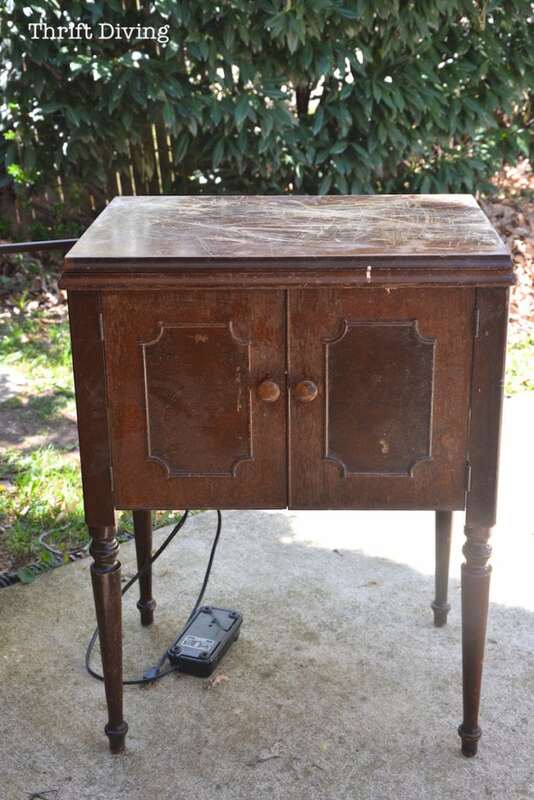 I was also able to reuse the pulls from this old vintage dresser just by using Rub n’ Buff! I don’t just love to paint old furniture. I love to find the details and them highlight them in creative ways. 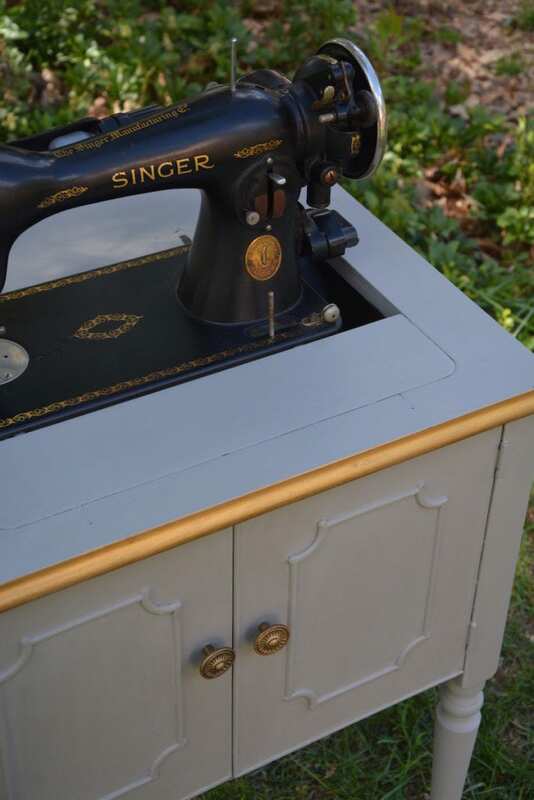 I had found this old vintage Singer sewing machine and used Rub ‘n Buff along the edge to bring out the detail of the piece, to match the goal in the sewing machine. I did the same thing to this green and gold desk I did a few years ago. 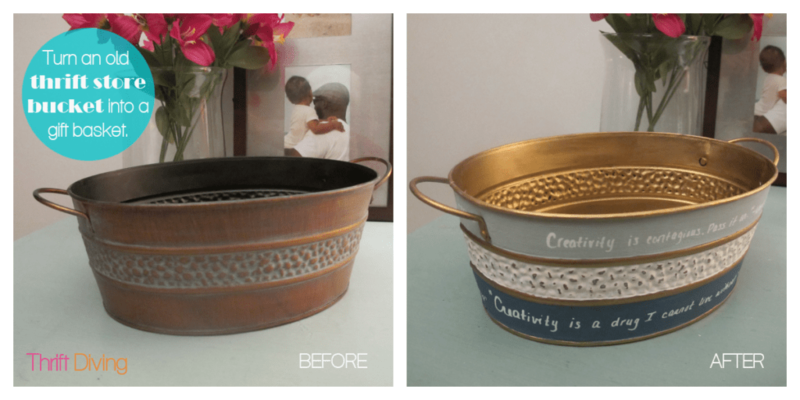 I loved the way this thrifted metal bucket turned out! 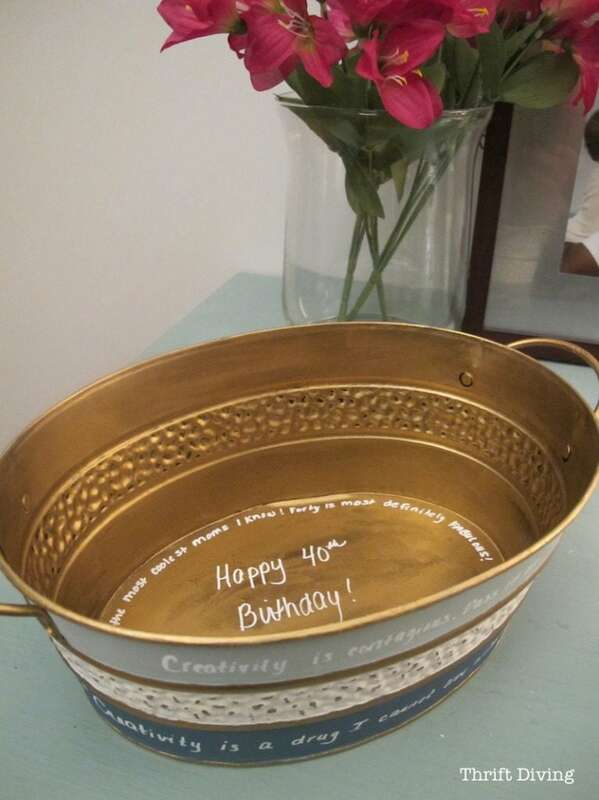 I needed a great 40th birthday gift for my friend and decided to make a DIY craft pack for her with my favorite crafting supplies. I loved how pretty the inside turned out! I also used it on the bottom. This is one project I haven’t tried yet, but with Rub ‘n Buff, it’s easy. But use painter’s tape around the legs of a chair or table, then wipe on Rub ‘n Buff below the tape, then buff, and peel off the tape. Super easy! 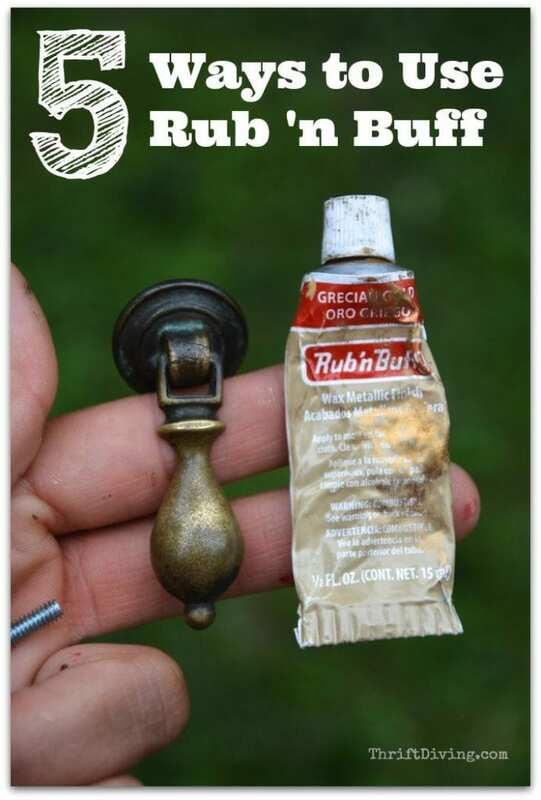 Have you ever used Rub ‘n Buff? What is your favorite use for it? Leave a comment below and share your DIY skillz! Does rub and buff work on decorative glazed ceramic pieces? How long does it last generally? A question because I want to try this but…Can this be used on a pre-painted clay pot that is going to be exposed to the elements? I spray painted a chandelier with hammered copper paint. I’d like to have some black highlighted areas and wonder if Rub n Buff would be good for this. It would be great. Have used this stuff since 70s and it is great to fix up old frames, furniture, jewelry, etc. She is using it much heavier than i do – it is a great highlighter, a super shabby chic or where you want the color underneath or wood grain to come through. Great on leather anything but you should buff it well if you want it to not wipe off on something. It doesn’t get shiny really like plastic – but is more a sheen. i will have to check my tubes, I don’t remember it being made of wax because I have spray painted over it and then highlighted another color. You can’t paint over wax which is why I don’t wax ie asliane wax furniture. Anyway – this is a product that has been around for years and stands the test of time. Note it does have wax but I guess when I have sandpapered to make look shabby – it was enough to allow varnish to stick. Many times I didn’t need to use any paint or varnish because I used the rub’nbuff as a last step too. I’m applying Rub n Buff to the high surfaces on a lamp that has been painted with chalk paint. Do I need to put a finishing wax under the rub n buff or do I put finishing wax on top of it? Advice please, anyone. Thank you. Is Rub n’ Buff a water or oil based product? I would like to add a touch of gold paint to my oil painting, and can only use oil based products. The Rub n Buff package says it is for porous surfaces. How do you get it to stick on metal? When I tried it, the was just rubbed off and never adhered. Thanks! Hey there! When you’re wiping it on, try not to use a heavy hand. Very light rubs across the surface with your finger helps. You can wear gloves so you don’t get it stained all over your finger. Hope that helps! Thank you. I’ll try that! Hi Serena, I also have an old Singer sowing machine that I want to make pretty again. Which color of the rub n’ buff did you use on your sowing machine? I’ve used it to touch up/change the metal on a few lamps. I also used it on screws and hinges for a storage cabinet.